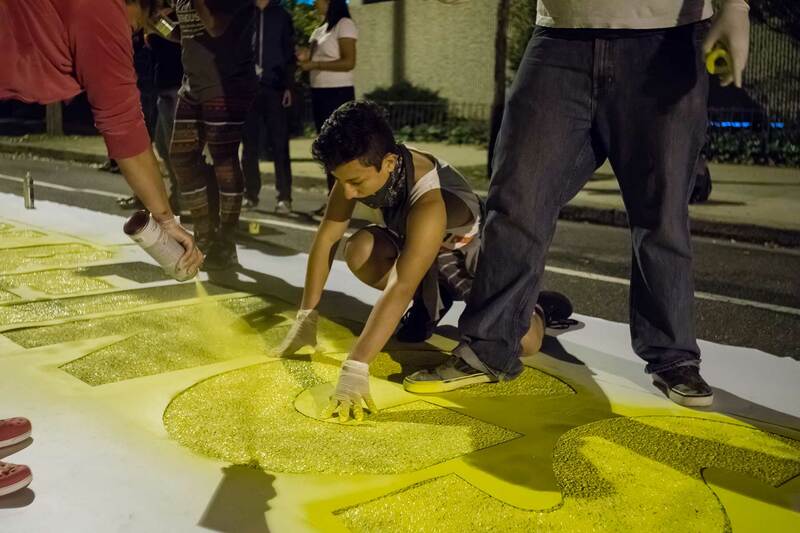 Michelle Angela Ortiz is a Philadelphia-based muralist and community arts educator who uses her art as a vehicle to represent people and communities whose histories are often lost or co-opted. 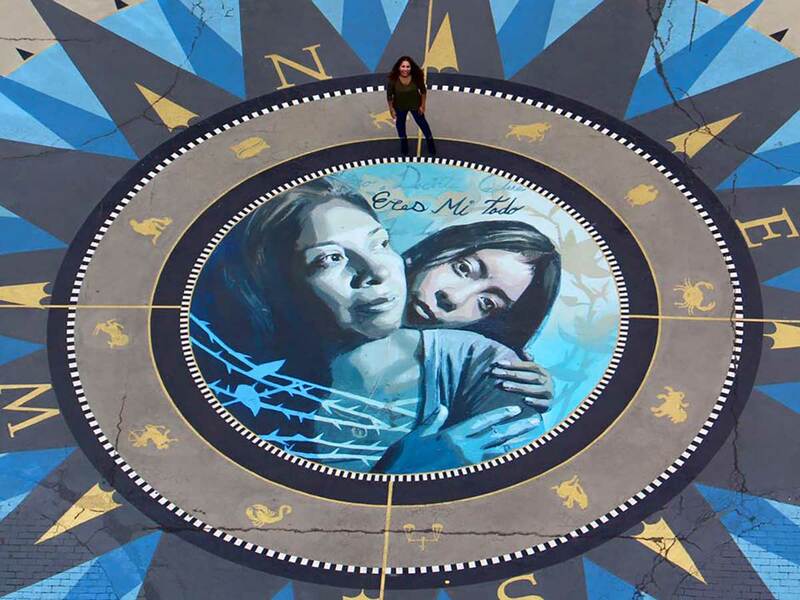 Her work utilizes public spaces to build human connection, compassion and to inspire action. I usually define myself as a visual artist, muralist and community arts educator. My elevator speech is that for the past 15 years I’ve been utilizing public art and public spaces to create platforms for social change. 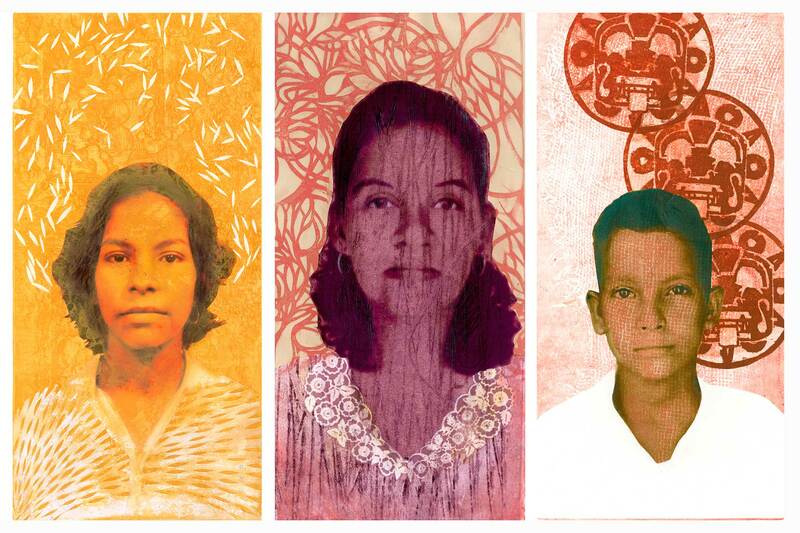 I draw from my own narrative as a child of immigrants, as a woman and as a mother. I work closely with communities whose stories are often unheard or ignored. This ranges from formerly incarcerated men, to indigenous communities reclaiming their home, to immigrant youth navigating in a new city. 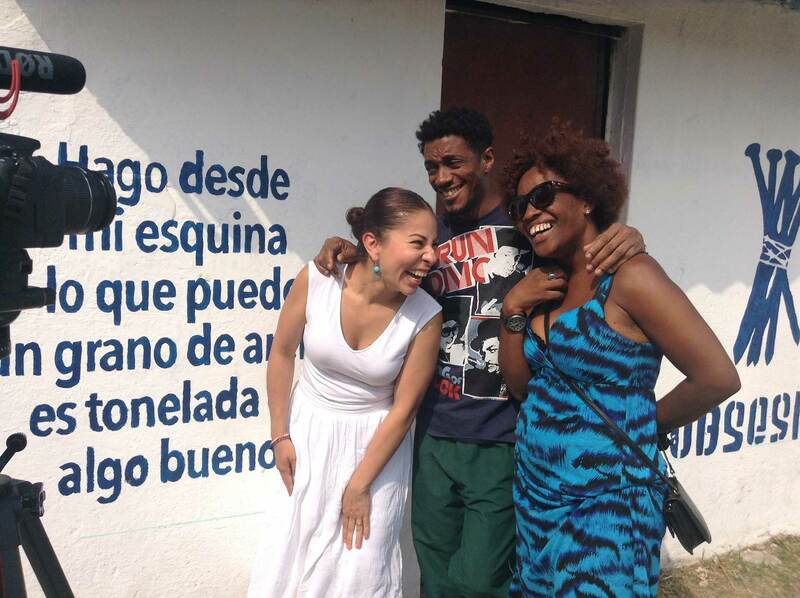 Michelle Angela Ortiz and Obsesion, the pioneers of Cuban Hip Hop. I still live on the same block I was born and raised in South Philadelphia, which has made me able to see a lot of the changes over the years. I travel a lot, but I always come back home. This city is really honest, and between the grit there’s so much beauty. I live near the 9th Street market, where my mother worked for 25 years. The Market is a place where so many immigrant families, including my own, found a space to build a better life for themselves. How would your work be different if you didn’t live in Philly? One thing that I always think about is that I’m married to someone who isn’t from Philly. I feel like I’m blessed in that I can stay in the same neighborhood, close to my family, but still grow as an artist. There’s such a thriving arts community here. Beyond the over 3000 murals in the city, there has always been a thriving art culture here. So many people leave their homes to find opportunities— to be able to live and work and build here is a blessing. When I’m asked to come work with a community, I feel at times that there’s a sense of urgency on their end to convey a message and that helps me. What was your first travel experience? The first time I traveled was at the age of seven to visit family in Colombia. It was the 1980’s, during the height of drug violence both in the U.S. and in Colombia. A lot of people criticized my parents because they thought they were putting us in danger. That first trip abroad really impacted me and influenced my perspective as an artist. Our parents ensured we stayed within our neighborhood block when we were growing up because they didn’t trust the city. There are some Philadelphians that never leave their block, and I would say that it is part of the city’s culture. During my trip to Colombia, I felt the most free I ever have. There was a sense of community there, I felt safe and I felt I could go anywhere. That experience fed into my need to explore and become interested in knowing more about my city as an adult. I had heard stories about the struggles of my mother and grandmother growing up in Colombia, but it wasn’t until that trip that I understood what true poverty and true wealth was. Both of my parents didn’t have access to a full range of education and resources, which led them to emigrate. They were able to do more in the U.S. than they could have in their own home countries. Family stories influence Michelle’s studio work. I was taught in college that the success of an artist was measured by being in a gallery and having your art sell for a certain amount of money, but I think it’s equally important to work with communities. In 1998, I found myself leaving the four walls of my studio to work directly within communities. Since then I’ve traveled and worked many communities through independent public art projects and as a United States Cultural Envoy in Fiji, Mexico, Argentina, Spain, Venezuela, and Honduras. In Cuba, I completed the first U.S. State funded public art project since the re-opening of the United States Embassy in Havana last year. It was an amazing experience to stay in two Airbnbs in Havana and meet the families that opened their home to me. 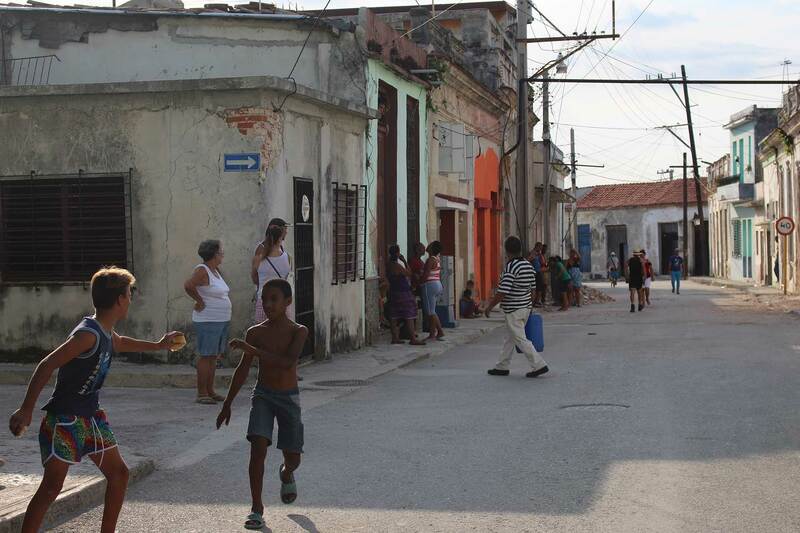 It helped have a deeper understanding of their stories as Cubans living during this moment of change. 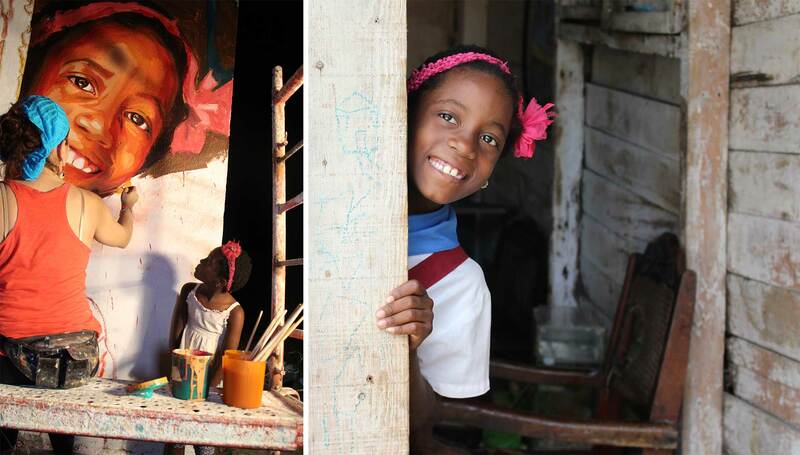 Process and images of “Somos Regla Mural” in Havana, Cuba. Photo credit: Michelle Angela Ortiz. What are some other places you have visited that inspire your creativity? The largest numbers of murals I have done abroad are in Mexico. Mexico boasts of its indigenous culture and tourists come to see the temples and ancient frescos. The reality is that the living breathing indigenous people are discriminated against. For this reason, I worked closely with Habitajes to connect with both the Mazahua and Otomi indigenous communities that have struggled greatly. These two communities have fought for 15-20 years for the right to decent housing– they left their hometowns because there was a lack of opportunities, and they migrated to Mexico City where they experience violence and fear for the safety of their children. I feel that murals are connected to Latin American culture. They’re how we raise awareness and educate, how we get our message across when we feel we are being ignored. I selected a core team of 10 local artists that are both committed to their artwork and in engaging the community in their creative process. I always choose to work with local artists to sustain the work with the community beyond the life of a project. 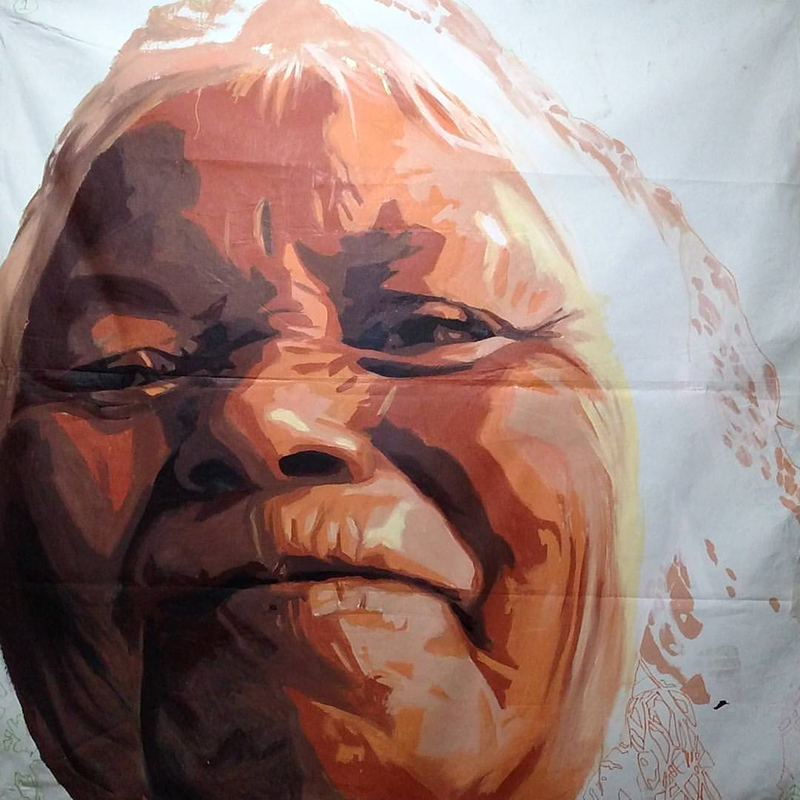 Through my training, I share my techniques on how to make large scale murals and also strategies in engaging the community in a genuine way. In November 2015, we created two six-story murals to decorate the new housing that was built for over 80 Mazahua and Otomi families. The murals reflect the migration and struggles of each community. It gave them a moment to come together to reflect, connect and be seen and heard through their images and messages conveyed in the artwork. Portrait of Doña Francisca, Otomi elder living in Mexico City- Photo credit: Michelle Angela Ortiz. What were some defining moments during this project? One Otomi woman in her 70’s had witnessed every stage of what the community has gone through- leaving her pueblo, migrating to the city, living in the streets, and now having a safe place to call home. During the creative sessions I led, the indigenous youth were able to hear her story and break down any generational barriers. Most of the youth are ashamed to speak their native language ñanu and dress in their traditional clothing because of the discrimination they face. The session allowed both the youth and elders to hear one another and to reconnect with their traditions and culture. One of the tasks I asked our youth to do was to translate the quotes we came up with for the murals into their native language. This made the youth connect with their elders who preserve the language. One of the elders was then inspired to begin offering classes to teach their indigenous language to the youth who had begun to forget it. 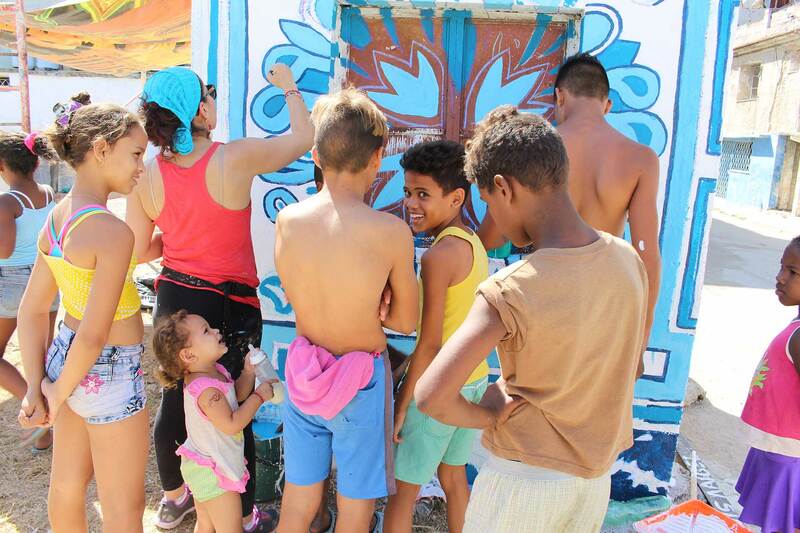 These experiences move beyond the walls of the mural, they are lived moments that contribute to the richness of bringing people together through art. 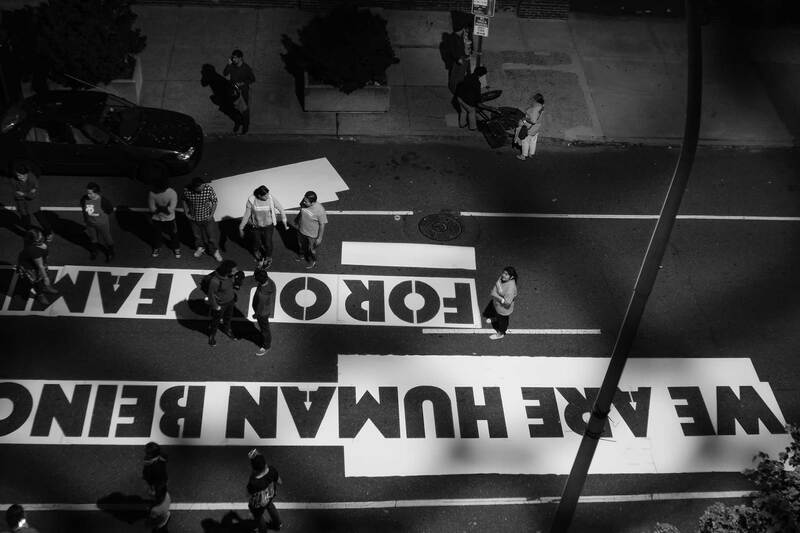 “We Are Human Beings -Familias Separadas,” installation process and final mural in front of the ICE building in Philadelphia. Photo credit Jose Mazariegos and Steve Weinik. What are the major themes that guide you and show up in your work? What’s always interesting for me is working with communities that are trying to overcome situations. I have declined projects that I don’t feel are in line with my values. I feel that murals are connected to Latin American culture. They’re how we raise awareness and educate, how we get our message across when we feel we are being ignored. 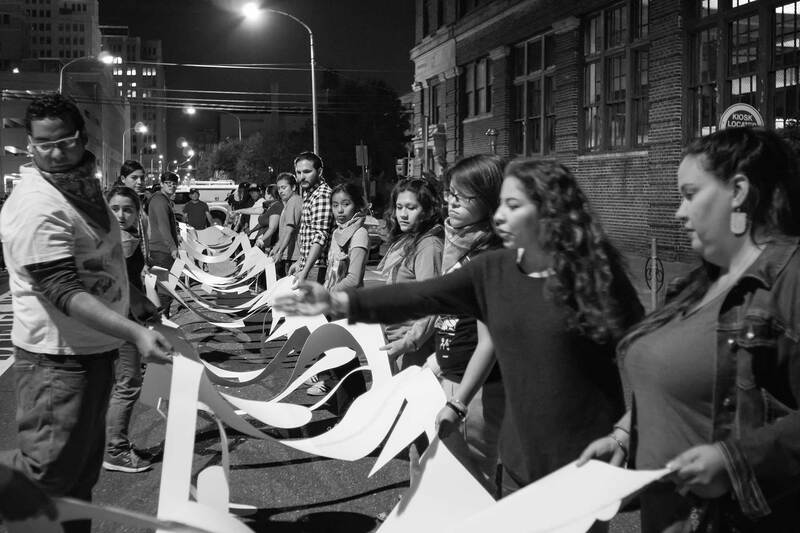 For the past seven or eight years I’ve been working closely with undocumented Mexican immigrant communities, especially in Philly, and their experiences are different from immigrants that settle in California, Arizona, Texas. I feel that the national conversation about immigration does not represent the narratives of the other immigrant- Afro-Latino, Latinx, Latin American- especially living in the Northeast of the United States. I use a lot of portraiture and the words of community members to create something that is not confrontational, but still powerful. I create work in response to these critical issues. My recent project,“Familias Separadas”, is a series of temporary site-specific public art works that mark the locations and stories of immigrant families affected by deportations. On “Columbus Day” last year, I created and installed a 90-foot long stenciled image. The image were the words of Ana, an undocumented mother who is fighting against her deportation and was detained at the Berks Detention Center, a family prison, for over a year in Pennsylvania. 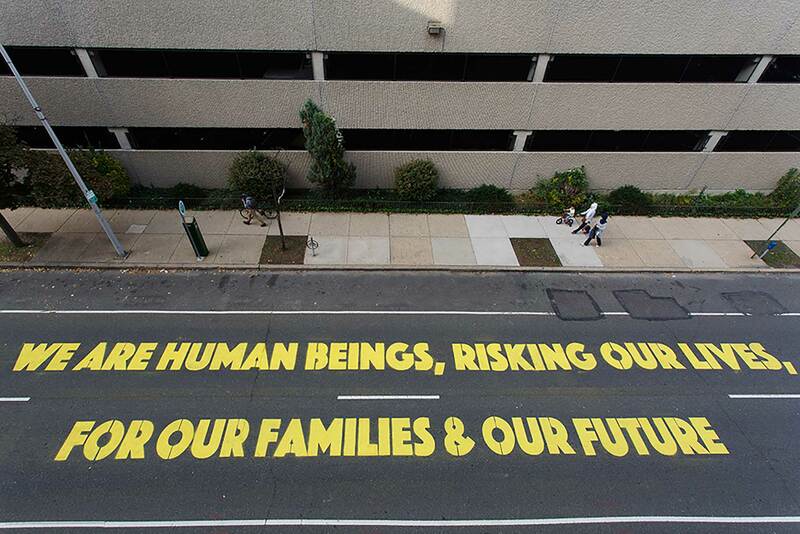 Together with the 30 volunteers including undocumented families from Juntos, we laid down the words of Ana in front of the Immigration Customs Enforcement Building in Philadelphia. “Eres Mi Todo installed in City Hall.” Photo credit Al Dia News. While many of the volunteers might usually look at this building in fear, they were able to come together in community. Our mural didn’t say anything disparaging– we were sharing our struggle. It’s one moment in the greater discussion about immigration. My work is about understanding how I fit into these discussions, how I provoke empathy, create awareness, spark action about these issues and do it in a way that is poetic and powerful. To see more of Michelle’s work check out her website and follow her on Instagram.